Hiroshima Hostel EN, Hiroshima, Japonia : Rezerwuj teraz! Hiroshima Hostel EN is a hostel with a bar / izakaya at ground level. It was created with the intention to connect people, be they travelers or locals looking for a drink and a good time. 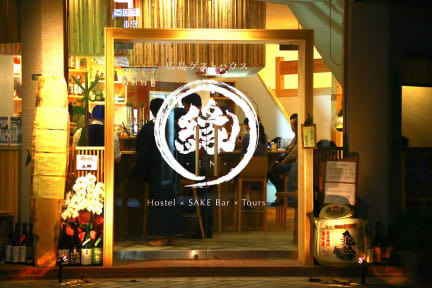 The hostel is located on the second floor of EN and offers beds in a traditional Japanese style, offering foreign visitors a part of Japanese culture and Japanese guests a reminiscent feeling. We offer a mixed dormitory, female-only dormitory and a private room that fits up to 3 guests. Every bed in the dormitories has its own private space and is closed off by a traditional noren. Created in Hiroshima, the tatami flooring is both sturdy and comfortable at the same time. On top is a futon to experience the true way of Japanese sleeping. It is said that this type is especially good for your posture and back. A personal safety box is also found inside and is equipped with a lock. The private room is made in a traditional Japanese style. Tatami flooring and futons to sleep on. The private room is ideal for families traveling together or guests looking for some more privacy. The common space has tatami flooring section where guests can relax and hang out. Try some origami, read a book or have a chat with some of your fellow travelers. There is a refrigerator to store your food or drinks. Facilities consist of 2 restrooms, 2 showers, 4 sinks, hairdryers and rental towels, toothbrushes, etc. The bar / izakaya is open in the evening from Thursdays till Monday* and serves local drinks and food from the Hiroshima area. Try some smoked venison, wild board frankfurter and many more special dishes. We also have a good selection of local and nationwide sakes and rotate our selection based on the season and newly found gems. Other special drinks include wine from Miyoshi and craft beer from Kure. Guests staying at the hostel get a free “Welcome” drink every night they stay over, so they can just sit back and relax or start a conversation with the staff or some other patrons at the bar. Whenever it’s possible we like to eat together with our guests and make some special Hiroshima meals like Oyster Hotpot.